Phu Yen (VNS/VNA) – Many fishermen in the central region have reported bumper catches during Tet (the Lunar New Year). In Phu Yen, one of the country’s biggest tuna fishing provinces, many boats from Tuy Hoa city that went offshore before Tet (February 5) returned on the fourth day of the new year, each with 25 – 30 fish weighing a total of 1.2 – 1.5 tonnes. Most made a profit of 70 – 200 million VND (3,000 – 8,600 USD), according to their owners. 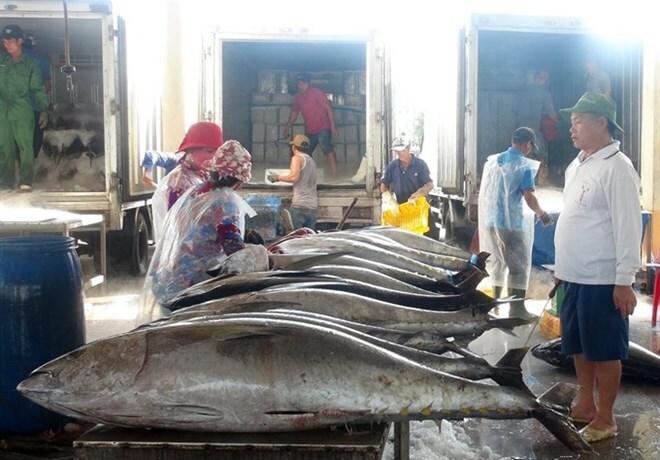 Traders at the port bought the fish at 130,000 VNA (5.6 USD) a kilogramme. Nguyen Van Bin said he caught more than 30 tunas weighing a total of 1.5 tonnes after fishing offshore for 18 days. Fishing during Tet brings a higher profit than normal days since the price of tuna is high then, he said. After the fourth day of the new year more than 60 boats that went fishing for tuna, mackerel, cuttlefish and other species returned to Dong Tac and Phu Lac fishing ports in Phu Yen. Boats that fish near shore also got good catches after resuming just after Tet. Thousands of fishermen in Ninh Thuan, Binh Dinh and Quang Ngai provinces reported bumper catches of anchovy on the fourth day of the year. In Ninh Hai and Thuan Nam districts and Phan Rang – Thap Cham city in Ninh Thuan, each boat caught 3.5 – 4 tonnes of anchovy in one day of fishing, earning around 50 million VND (2,150 USD). The main anchovy season is between Tet and the fourth lunar month. In Nghe An province, dozens of fishing boats filled with herring docked at Quynh Phuong fishing port in Hoang Mai town on the fifth day of Tet. Nguyen Van Thanh of Hoang Mai’s Quynh Phuong ward said he had caught four tonnes of herring and nearly two tonnes of other fish in just one day of fishing near shore. Every man on the trip earned nearly 10 million VND (430 USD), he said. Ho Xuan Huong, Chairman of the Quynh Phuong Ward People’s Committee, said the bumper catches in the first trip after Tet would motivate fishermen to go offshore. The commune has more than 600 fishing boats and expects to catch 20,000 tonnes of fish and other species this year, according to the chairman. Many boat owners in the central and southern regions who did not go offshore during Tet have resumed fishing. In Ba Ria – Vung Tau province, many fishermen left on the fourth day of the year. The prices of fuel, fishing tools and other materials are steady and there are enough men for fishing, according to boat owners in the province.